According to statistics, children in Russia have grown bigger over the past 10 years, largely due to changes in lifestyle and the quality of food. Experts have expressed concern over the trend and claim it is a symptom of a growing health problem among the country’s young. Russian schoolchildren no longer fit into their uniforms. Experts point out that children in Russia have grown bigger over the past 10 years, largely due to changes in lifestyle and the quality of food. It also appears that parents are paying less attention to their children. Natalya's son started school this year but she has never been to the school canteen and is not particularly interested to know what her son is given for lunch. She has seen on the school’s promotional video that the food is quite decent: meatballs, mashed potatoes, sausages, etc. 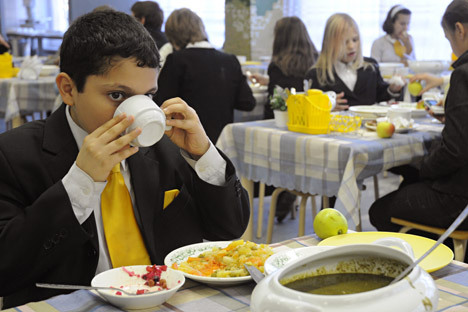 "He complains that he doesn't like the food, although the school offers a proper lunch of three courses,” says Natalya. “Breakfasts are free, while a lunch costs 95 rubles (about $3). I give him sandwiches, some fruitcake or a yogurt to take with him to school, anything he asks. At school, he buys chocolate bars and different ice teas." Natalya suspects that her son is just being picky but she lets him have his way. School uniform manufacturers have collected statistics and have found out that some 10 percent of children no longer fit into uniforms that have been made to the same standard measurements since the early 2000s. Schoolchildren have grown bigger and plumper. Interestingly, this problem affects boys more than girls. Russian research suggests that the problem of obesity among schoolchildren has not yet become catastrophic, but a negative trend is evident. "About 5.5 percent of children in rural areas and 8.5 percent of children in urban areas are overweight. This is a topical problem for Russia, as the number of overweight children is on the rise," says endocrinology professor Yuliya Zotova. Nutrition specialist Yelena Solomatina agrees: There are far more overweight children now than there used to be, and children are growing bigger. She attributes these changes to several factors. The main one is changes in the structure of food, with children eating a lot of products containing stabilizers, preservatives and high quantities of sugar. "The main difficulty is that the less natural a product is, the more difficult it is to digest and the more residue it leaves in the body. Confectionery manufacturers and advertisers devise bright packaging that attracts children. Children ask their parents to buy them sweets, which their bodies do not in fact need. There are more foods like these than there used to be," Solomatina points out. She explains that in order to cope with stress, the body needs more useful micronutrients and vitamins, which can be obtained only from healthy food, not from sweets. "Sweets give only a nominal relief from stress. Moreover, they overload the body with sugar. Taste buds become desensitized, the body requires more sweets, which inevitably results in extra kilograms," says Solomatina. Furthermore, children develop habits faster than adults do and when they grow up, they take this habits with them into adult life. Another factor contributing to more children becoming overweight is lack of exercise. "The new generation prefer computer football to the real thing," the dietician concludes. Allergist and immunologist Marina Apletayeva points out that a child's weight is the parents' responsibility and they should pay more attention to what their offspring eat. "Even at school, children are often given pre-cooked meals that are made elsewhere and are then only warmed up at the school canteen. Not all schools offer a second breakfast or a proper lunch. Meanwhile, parents fill their children's lunchboxes with sandwiches, chips, snacks, etc. Children are just hungry, they don't realize what is good for them and what is not," says Apletayeva. She continues: "One good thing is that schools have now at least removed vending machines with fast food and fizzy drinks. As a result of all these factors, children end up consuming most of their food in the afternoon and evening, when the body tends to store energy, hence weight gain." However, when parents wake up to the problem and try to find out why it is that their child no longer fits into his or her school uniform, the problem is usually already in an advanced stage and it is time to see specialists and consider serious treatment. Family psychologist Anna Belinskaya says that when the problem is treated seriously, it can usually be successfully resolved. "Indeed, with a problem like child obesity, parents usually turn to a psychologist when their child is first diagnosed. It is bad and good at the same time. Bad because the situation has already gone too far, the child's psyche has already been affected and self-esteem is low. Good because the parents have realized that they have a problem, and attempts to seek professional help usually point to a determination to resolve the problem," she says. Nadezhda's son is 14. She says she tried to put him on a diet, but he refused to listen to her and, like most teenagers at that age, only argued with her. "It took quite a long time for him to realize that it was not about my whim but about his health. Another thing that helped was that he began to care about girls in his class finding him attractive," she says.